Switching roles: Odell, left, and Farley, right. 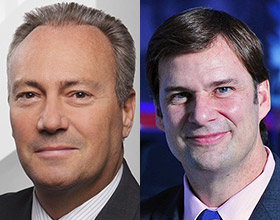 DETROIT -- Ford global marketing chief Jim Farley will move to Germany to steer Ford of Europe and swap jobs with European boss Stephen Odell, two people familiar with the plan said. Odell, who has led European operations for Ford since 2010, will succeed Farley as head of sales, service and marketing worldwide, the sources said. During his 34-year career at Ford, Odell, 59, has held a variety of marketing and sales jobs, including some with former affiliates Volvo, Jaguar and Mazda. Ford declined to comment. The move has been in the works for at least six months, according to the sources, who said an announcement may come as early as today. The shift will give Farley, 52, his first shot at directly running one of Ford’s regional operations. The Ford of Europe role also includes responsibility for the Middle East and Africa. It also marks the second major personnel move in the era of Mark Fields, who succeeded Alan Mulally as CEO on July 1. Later that month, Fields named Kumar Galhotra as president of the company’s struggling Lincoln brand. Farley had been in charge of Lincoln until Galhotra’s appointment, which took effect Sept. 1. Ford of Europe, along with the rest of the region's carmakers, has struggled as the economy has undergone a lengthy recession. Ford lost $1.6 billion in Europe last year and in September withdrew its forecast of a 2015 profit. The company expects its European operations to lose $1.2 billion on a pretax basis in 2014 and now projects the red ink will be reduced in 2015 because of capacity cuts. Since coming to Ford from Toyota Motor Sales U.S.A. in 2007, Farley has pushed Ford to become a leader in digital marketing, especially social media prelaunch campaigns for vehicles. Signature efforts have included the Fiesta Movement, Escape Routes and Random Acts of Fusion campaigns, which stoked online interest in cars before they hit showrooms. Farley arrived at Ford as a prized recruit, following a meteoric career at Toyota. He was general manager of Lexus and instrumental in launching the Scion brand. Farley quickly added responsibilities at Ford. His current title is executive vice president of global marketing, sales and service. Prior to 2010, he also oversaw Ford’s operations in Canada, Mexico and South America. Odell joined Ford in 1980 as a graduate trainee for Ford of Britain, becoming vice president for marketing and sales at Jaguar in 1997. He had executive sales and marketing posts at Mazda and Ford of Europe before becoming CEO of Volvo in 2008. He joined Mazda Motor North America as a vice president of marketing and sales in 2000, the same year Fields was named president and CEO of the Japanese automaker. Mazda was controlled by Ford at the time. Odell has led Ford’s effort to end losses at its European operations under two major initiatives. Ford of Europe has been shuttering plants to bring manufacturing to 80 percent of capacity, which executives see as a prerequisite to profits. Ford will close its Genk, Belgium, plant at year end. That move follows the closing of plants in Southampton and Dagenham, England, last year. Ford of Europe also is undertaking an aggressive product rollout, with 10 launches this year and 25 over five years. Still, the company’s third-quarter losses in the region widened to $439 million amid weakness in Russia. Ford no longer expects European auto demand will return to prerecession sales levels -- even by 2020.